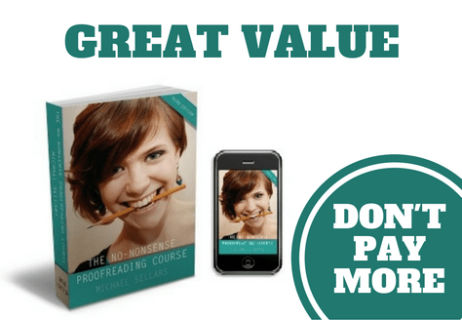 A Proofreading Course With An Affordable Price Tag. Finally. My proofreading course will pay for itself in less than two hours! Distilled from over 25 years of proofreading experience, I'll teach you to proofread like a true professional, earning $35 per hour, at a fraction of the cost of other proofreading courses. What's more, it comes with over 1,000 pages of bonus learning materials and a 30-day 100% money-back guarantee. Read on to find out why you don’t need to spend a fortune on a proofreading course and why, in the real world, proofreading qualifications aren’t worth the paper they’re printed on. ​“I am one of those many fools who paid a huge amount of money for a useless proofreading course. I now look on Mike as my mentor as I embark on a career. Thank you Mike.” Emma Steel, Proofreader and International Structural Editor. “What can I say? Worth every penny and then some! God Bless! This is a fabulous proofreading course.” Teresa Richardson, Proofreader. 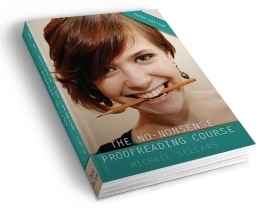 ​“As someone who has effectively been proofreading for thirty years, I found Mike’s No-Nonsense Proofreading Course an invaluable and very useful practical guide to many aspects of the discipline. I can wholeheartedly recommend it.” Jeremy Meehan, Proofreader. Why are other proofreading courses so ridiculously expensive? Most proofreading courses follow the traditional lesson-exercise-assessment-qualification route. This particular method incurs a great deal of cost for the course provider. The overheads of such a traditional training operation – administration, salaries, correspondence, materials and the sheer logistics of it all – can be very steep indeed. That’s where your $250, $400 or even $750 is going. And the fact is, many people are only too willing to part with these exorbitant sums of money when they discover that proofreaders can charge more than $35 per hour for their services. But don't let these potential rewards tempt you into parting with more cash than you need to as you take your first steps on the road to becoming a proofreader. Is all this expense really necessary? No, it isn’t necessary, at all. There are two aspects of the above operational approach that are utterly dispensable: assessments and qualifications, both of which incur high costs for the training provider, costs which are passed onto you, the eager proofreader-in-waiting. Let’s take a look at each in turn. Assessments, what are they good for? To quote the late, great Edwin Starr, "Absolutely nothing." Most proofreading courses tell you how to proofread then assess your progress. You send course work in and someone marks it. By and large, this course work consists of proofreading exercises. These exercises are likely to take the form of out-of-copyright material – extracts from Pride and Prejudice or A Tale of Two Cities, for example – with deliberate errors incorporated into the text. You receive marks for spotting these deliberate mistakes. But wait a minute. What exactly are these assessors marking? With a proofreading exercise, you either spot the errors or you don’t. Do you really need someone to point out the errors you’ve identified and those you’ve missed? Surely, you can do this for yourself. As long as the answers are made available to you, you’re perfectly capable of assessing your own progress. Proofreading qualifications, are they worth the paper on which they’re printed? I’ve been proofreading and copy editing for over 25 years. As a freelancer I’ve proofread and edited everything from novels and short fiction to complex clinical data and in-depth technical prospectuses. ​As Operations Manager in the publishing department of one of the UK’s largest retailers, I hired proofreaders, managed them and their workload, supported them and took responsibility for their professional development. I have never once been asked to produce a proofreading qualification. the job specification for the proofreader role. ​Not once in 25 years. But don’t take my word for it. Visit any online recruitment website, search for proofreader opportunities and see how often qualifications are mentioned. Don’t get me wrong, they may come into play as some kind of deal-breaker between equally matched candidates, but that’s about it. If I don’t need assessments and qualifications, what do I need to become a proofreader? It’s remarkably simple. You’ll need to learn the meaning and application of proofreading symbols. Then, you’ll need to learn a robust and effective proofreading methodology. Armed with these symbols and this methodology, you’ll need to practice. And practice. And practice. Once you’re confident you can proofread, you’ll need to gain some experience. Once you have a little experience behind you, you’ll just need to put yourself out there, market yourself. So, where can I find these ‘proofreading symbols’, and this ‘robust and effective proofreading methodology’? In The No-Nonsense Proofreading Course downloadable guide. What’s more you’ll find an abundance of advice on how to gain proofreading experience and how to approach potential employers and make yourself visible in the freelance proofreading marketplace. ...you’ll find plenty of free regularly updated exercises, with answers, on this very website. Plus, this unique proofreading guide points you to a near-limitless supply of challenging proofreading ‘exercises’ that will not only sharpen your skills but will also provide your resume with a significant credibility boost. And all for just $48.99. I don't need to tell you that's a fraction of the cost of other proofreading courses. Because you’ll be assessing your own progress and because I won’t be trying to sell you a qualification that’s of virtually no use in the proofreading job market, I don’t have any of the costly overheads that most proofreading courses pass onto their students. I’ve simply distilled 25 years of proofreading knowledge and experience into an easy-to-digest, simple to download manual. It's packed with tips, techniques and sound advice. So confident am I that you’ll find everything you need in my proofreading guide and associated learning materials, I offer a 30-day 100% money-back guarantee! If, after reading my guide, you don’t feel that it's set you on the road to confidently pursuing genuine, professional proofreading opportunities, just let me know within 30 days of purchase and I’ll refund you in full, no questions, no quibbles. 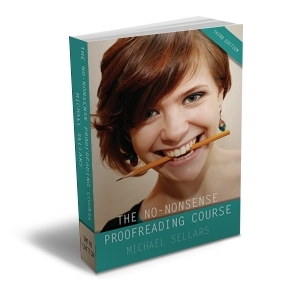 So, what will I find in The No-Nonsense Proofreading Course? 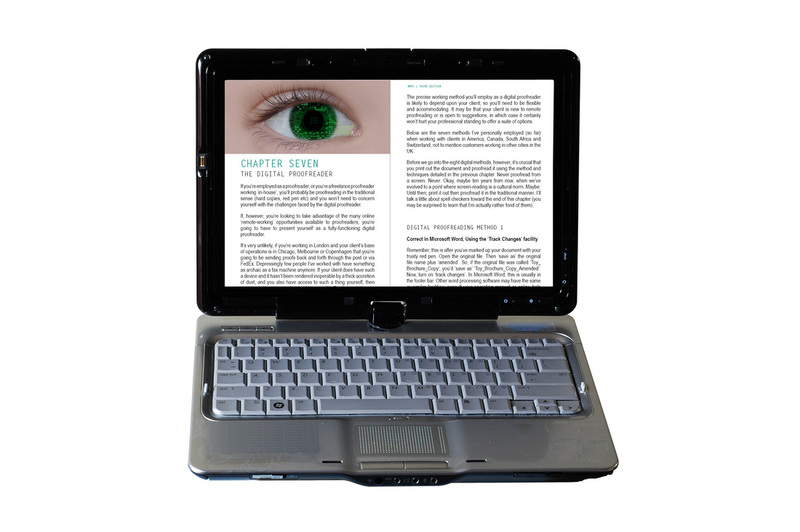 The No-Nonsense Proofreading Course can be read on your PC, mobile phone, iPod, iPad, Kindle etc. It has also been formatted to be 'printer-friendly', so, if you prefer a hard copy, two pages of the guide can be output on a single, landscape A4 page. Proofreading is not an innate talent. It can be taught. That’s precisely what this proofreading course promises to do. Or your money back. What a proofreader does and doesn’t do. This proofreading course gives you a day-in-the-life of the proofreader and covers the differences between proofreading and copy editing. Proofreaders’ marks and how to use them. No proofreading course would be complete without this chapter. But this proofreading course also tells you when proofreading symbols can be dispensed with entirely. Nothing gives the false impression that a skill cannot be learned than apparently impenetrable terminology. This chapter of the proofreading course cuts through the fog. Rather than being about innate talents, effective proofreading is about methodology and technique. This proofreading course teaches my own personal methodology developed over more than 20 years. What separates the amateur proofreader from the professional proofreader? It’s how they approach the supposedly corrected proofs. It’s during this messier phase of the proofreading process that serious errors can creep in. This proofreading course tells how to avoid these catastrophes. There was a time when a proofreader checked a proof (hence the job title). However, in this digital age, proofreading electronic media is becoming increasingly prevalent. 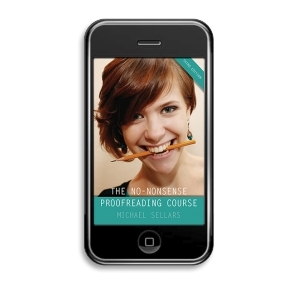 This chapter of the proofreading course explores the pitfalls and the opportunities. How to bridge the gap between proofreading and copy editing. The move from ‘accuracy control’ to ‘quality control’. This chapter of the proofreading course tells all. How to set up your proofreading business right now, for next to nothing. A proofreading course alone is useless if it doesn’t tell you how to promote yourself once you’ve acquired the necessary skills. This proofreading course doesn’t shirk this responsibility. Many of the bonus learning materials listed below will also contribute significantly to the success of your proofreading venture. 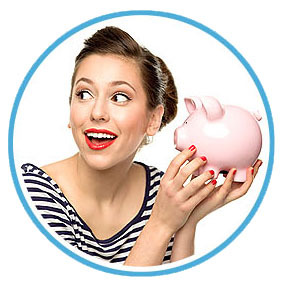 "How much should I charge for my proofreading services?" is a question I get asked all the time. In this chapter, I provide you with a rough-and-ready formula to help you quote competitively whilst ensuring you remain profitable. Another thing most proofreading courses fail to prepare you for: what to do when it all goes wrong and you let an error sneak through into a completed publication. Don’t panic! This chapter tells you how to prepare for this eventuality. The proofreader’s toolkit. 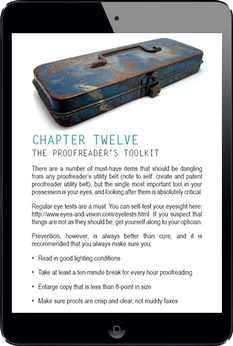 An inventory of a few things you’ll need in order to operate as an effective proofreader. Along with The No-Nonsense Proofreading Course, obviously! Although The No-Nonsense Proofreading Course favors a self-monitoring, self-evaluating approach, I wouldn't want you to think that I'm leaving you all on your own. That's why I operate a virtual open-door policy. All my customers are free to email me via the contact form, any time. I'll endeavor to get back to you within 48 hours (but it's usually sooner!). To date, I haven't failed to respond to a single email. Obviously, I don't quite have the resources to coach every one of you, but I have always done my very best. Order NOW and receive NINE essential eBooks ABSOLUTELY FREE! 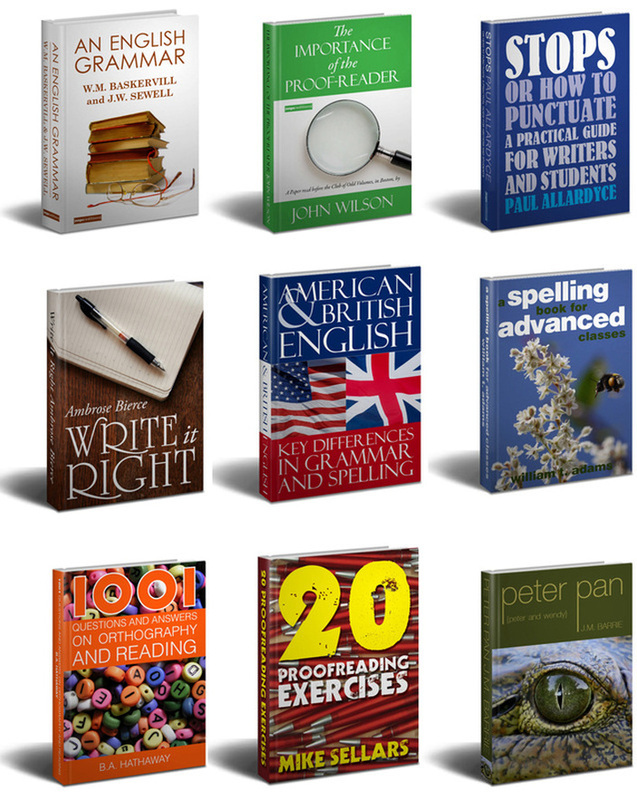 That's over 1,000 pages of indispensable material to help launch you on your proofreading career! Most proofreading courses actually have the audacity to charge you a premium for the kind of grammar instruction you can easily find in relatively inexpensive books like Fowlers Modern English Usage. At The No-Nonsense Proofreading Course, we're giving you all the English grammar information you need, absolutely free! When you pay for the guide, you'll find yourself directed to a download page which includes the course plus the nine great eBooks below. OVER 1,000 PAGES exploring the finer points of English grammar, punctuation, spelling, linguistics and the role of the proofreader. Plus pages and pages of proofreading exercises (you know, the kind of thing most proofreading courses will expect you to pay through the teeth for?). Covers everything you need to know about English grammar, from the parts of speech, through sentence analysis to syntax. Packed with invaluable information as well as heaps of challenging exercises to help you hone your skills, this is an essential volume for any budding proofreader. This handy guide details the uses (and abuses) of every punctuation mark: the full stop, comma, colon, semicolon, question mark, exclamation mark, parenthesis, inverted commas, apostrophe, ellipsis, dash and hyphen (and, yes, there is a difference between a dash and a hyphen). This is a compendium of literary and linguistic pet peeves by Ambrose Bierce, the prolific satirist and journalist, author of the much-loved Devil’s Dictionary. Interestingly, some of his targets have now crept into popular usage, while others are still hotly debated. Bierce’s withering tones are irresistible. As a proofreader, you’ll doubtless be hunting for work online. This is almost certain to result in offers from the other side of the Atlantic. So, it helps to know your ‘tap’ from your ‘faucet’, your ‘nappy’ from your ‘diaper’ and your ‘boot’ from your ‘trunk’. And that’s just the tip of the iceberg. This eBook explores everything from verb morphology and use of tenses to vocabulary and idioms. Essential. Although we live in the age of the spell checker, there really is no substitute for the human brain. These 163 spelling tests will challenge and develop even the most enthusiastic Scrabble or Boggle fanatic, with words like ‘succedaneum’, ‘hornblende’, ‘mucilaginous’ and ‘auscultation’. Fun and educational. Orthography is the science and art of the letters of a language and concerns the nature and power of letters, and correct spelling. A useful (not to mention fascinating) bedrock for any up-and-coming proofreader. Why become just a proofreader when you can become a knowledgeable and captivating proofreader? 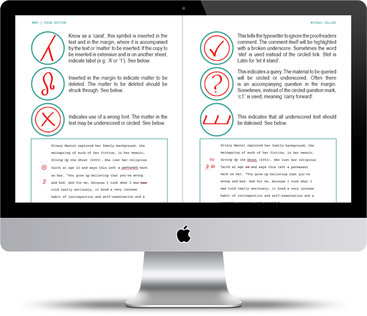 The 20 FREE proofreading exercises available on this website conveniently bundled into a single easy to download, easy to access eBooklet. A crucial part of any proofreading training course and the kind of thing most proofreading classes will fully expect you to pay for. Available to buy elsewhere on this site, this unique proofreading exercise is available FREE with The No-Nonsense Proofreading Course. Approximately 100 subtle, hard-to-spot errors have been secreted within this distractingly readable text (the wonderful 'Peter Pan'). Not just a proofreading exercise, this is a proofreading concentration and endurance test that will help prepare you for the real world of professional proofreading, whether you'll be proofreading from home or in a busy office or studio environment. Your proofreading training will not be complete until you've persevered through this arduous little proofreading test. Forget proofreading qualifications; this is all you need to prove to yourself that you've got what it takes to chase after those proofreading jobs with confidence. All of these volumes should form an essential part of any proofreader's arsenal before they set out to defend the written word. Most proofreading courses will charge you a pretty penny for this crucial information. But not The No-Nonsense Proofreading Course. 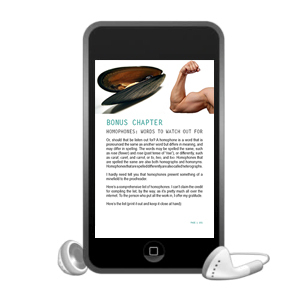 For a limited time only: FIVE ADDITIONAL eBooks to help you run, promote and maximize your proofreading business! Worth $39.95. For you: $0.00! This easy-to-follow eBook tells you how to write compelling headlines, speculative letters and website copy that will convince people to use your proofreading services. RRP: $7.99. Once your proofreading business takes off and the work starts coming in, managing your workload becomes a critical factor. 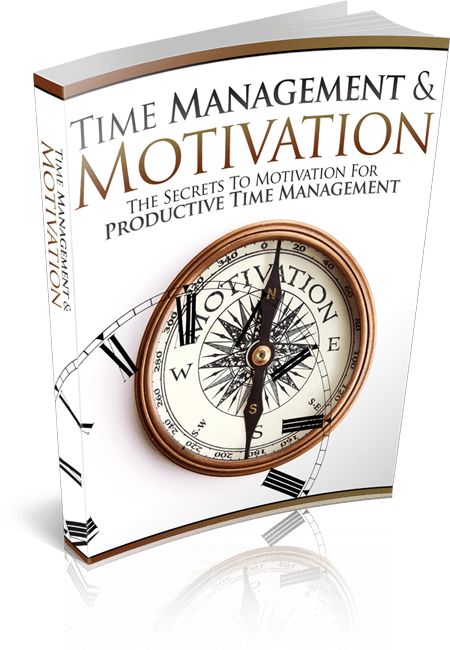 This eBook covers how to prioritize and schedule your proofreading assignments, how to avoid procrastination and how to motivate yourself into getting the job done even when you feel as if the odds are against you! RRP: $7.99. Even though The No-Nonsense Proofreading Course provides a highly effective methodology, an organized mind will prove a huge asset as you embark on your proofreading career. 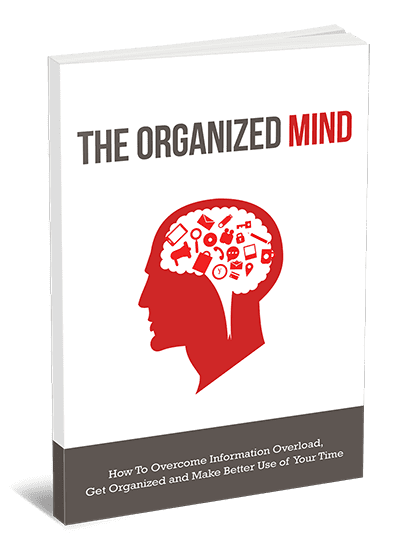 This eBook shows you not only how to organize your mind but also your working environment, your home, your social life and much more to ensure you get things done. RRP: $7.99. 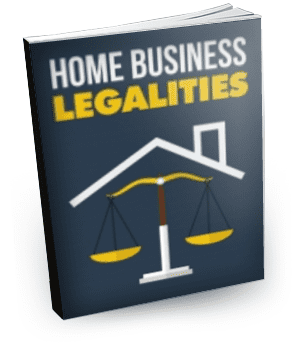 There are several different legal issues that the individual should consider before setting up a home-based business enterprise. Failing to look into this important area can eventually lead to problems which may become so bad that it could and usually does affect the future of the business entity as a whole. 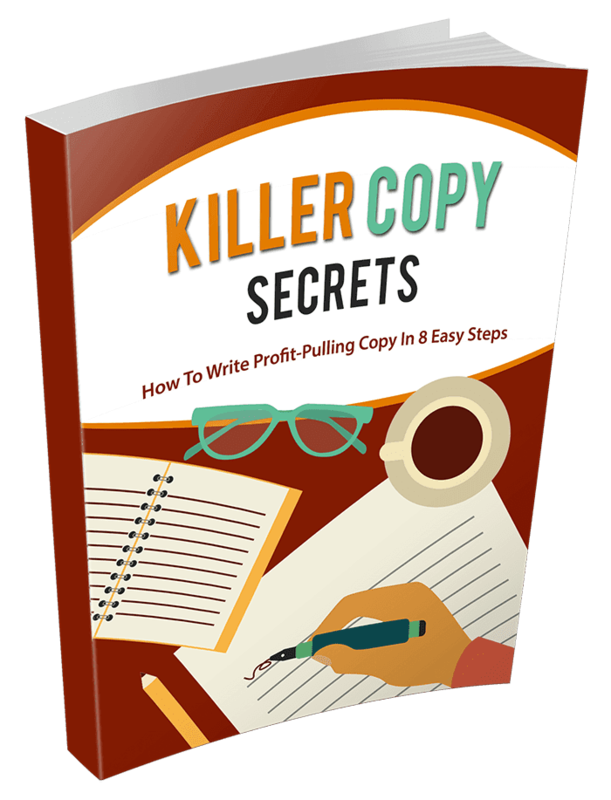 This eBook is a great introduction to this tricky area. RRP: $7.99. 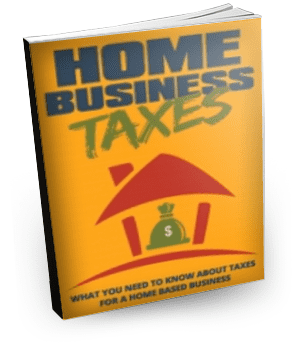 A lot of people today opt for starting their own home-based business and popular as it is there should be some thought given to the tax breaks that one can (and cannot!) enjoy through this form of business. This eBook will get you started. RRP: $7.99. But that's not all. Buy The No-Nonsense Proofreading Course TODAY and receive this fantastic 'Brain Health' e-learning bundle completely free of charge. As a proofreader, your brain is the single most important gadget in your toolbox. This e-learning bundle will teach you how to nurture your brain and improve brain function, through training, nutrition, CBT, embodied cognition and Nootropics. 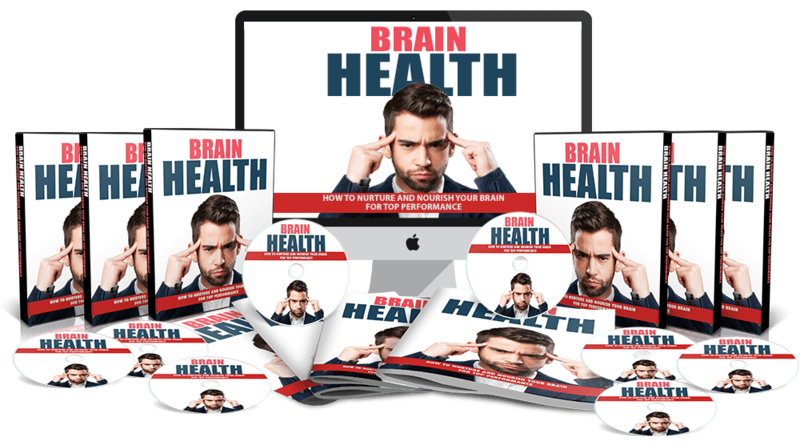 The bundle includes the Brain Health eBook, audio book and training videos. Plus your Brain Health Cheat Sheet, Resource Sheet, Mind Map and the small but powerful 'Brain Unleashed' concentrated mini-guide. I've tried to cover absolutely everything here. But if you still have any questions or concerns, please don't hesitate to drop me an email. I'll get back to you as soon as I can. Click here to use the contact form. Thanks! Mike.